Cooking Matters Colorado is part of the national nonprofit organization Share our Strength, and its No Kid Hungry campaign to end childhood hunger. The Cooking Matters program empowers families with food skills and improved self-sufficiency in the kitchen through cooking and nutrition courses, interactive grocery store tours and pop-up tours in 54 of Colorado’s 64 counties. The organization also offers healthy meal preparation education for childcare providers. Since its inception in 1993, Cooking Matters Colorado, along with its 600 volunteers, has served 90,000 families. “One of the great outcomes of this program is that families who used to run out of food report rarely running out of food after months, and ideally a lifetime” said Development Manager Liz Kohn. Cooking Matters Colorado was the beneficiary of a special fundraiser—the Culinary Cricket Challenge. Twenty local chefs were tasked with creating dishes that include “challenging” ingredients, ranging from insects to beef heart to durian fruit, which has actually been banned from some hotels due to its terrible smell. The dishes were served at each chef’s restaurant, and proceeds from the sales went straight to Cooking Matters Colorado. Cooking Matters raised more than $12,000 with the support of chefs, sponsors and guests across Denver and Boulder. Cooking Matters Colorado was the recipient of a one by one® grant from promotional products retailer 4imprint®. 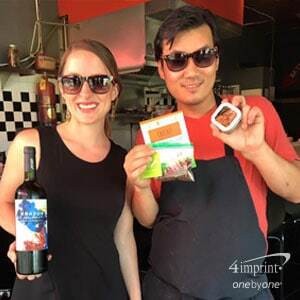 It used the grant to purchase sunglasses imprinted with phrase, “No Kid Hungry Colorado.” The sunglasses, along with a goody bag, were given to chefs and guests as thank you gifts. “We were so grateful we could pay it forward to all who gave so much,” Kohn said.